I’m wearing jingle bells in my ears. 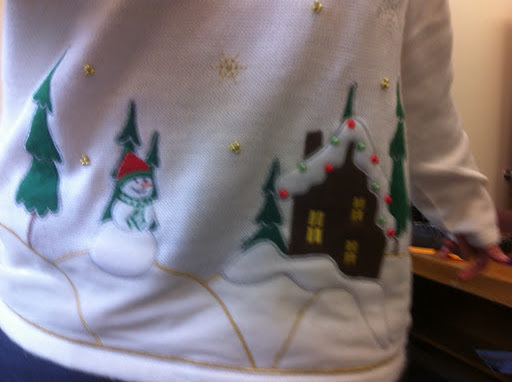 A giant off-white sweater with gold snowflakes, a gingerbread house, snowman and trees. 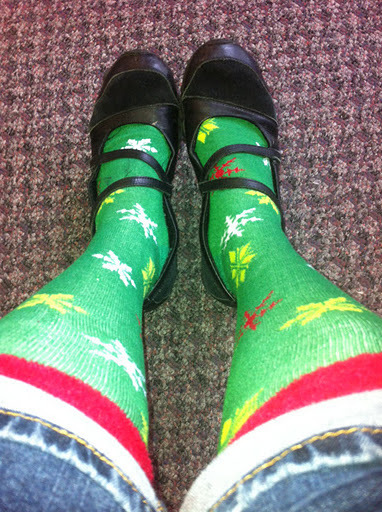 And red and green Christmas socks. I thought I was being ironic because I have my girls Christmas gathering tonight and wanted to be funny for Festivus. Apparently some of the people I work with think I’m being serious. I have failed Christmas Irony 101. Actually, no, they have failed because they wear this stuff on purpose for serious. That means I’m an epic winner. Right? This entry was posted in Uncategorized and tagged being awesome, fashion, holidays, irony by Just Call Me Mel. Bookmark the permalink.